Verified on 20 Apr 2019. Jet Airways is offering extra flat 10% (Maximum of Rs 700) SuperCash on domestic flight reservations online. This offer is applicable on return journey in economy class travel tickets. Now fly out with your wolf pack or entire family while paying less for your flight tickets! With the Jet Airways, group booking discount for more than 4 guests travelling together, enjoy an exclusive discount of 10% on every flight booking. Simply book directly on our website, jetairways.com or mobile app to avail this offer. We applaud the dedication shown by our Indian government officials. With Jet Airways, Indian Government official discount, enjoy an exclusive discount of 8% on every flight booking. Simply book directly on our website, jetairways.com or mobile app to avail this saving. Verified on 20 Apr 2019. Get flat 10% instant discount is applicable on base fare in Première and Economy from Mumbai to Kathmandu and Delhi to Kathmandu starting from Rs 10,594 on flights operated by Jet Airways. This offer Applicable on return journey only. No travel restriction. This offer is not applicable if booking is done using the Multi-city option. No additional Jet Airways coupons required to get the best discounts on jet airways flights. Plan your travel with Jet Airways and book flights online seamlessly. With over 600 daily flights and 64 destinations worldwide, you can now explore our extensive network of domestic flights and international flights at best fares. Jet Airways guests traveling in Economy can avail of Seat Select facility for a nominal charge. This facility is complimentary for JetPrivilege Platinum and Gold members basis the Fare Choices made for their travel. Enjoy special offers on flight tickets only when you book on our website and mobile app. Guests with disabilities travelling within India are entitled to exclusive discounts on Jet Airways flights. Now enjoy an exclusive discount of 10% on every flight booking. Simply book directly on our website, jetairways.com or mobile app to avail this promotion. Offer is applicable on select booking classes in Economy: Y, M, T, U, N, L, Q, S, K, H, V, O and W - 10% Off on flights within India. Here’s an offer you wouldn’t want to miss. Book a return flight in Economy under Y, M, T or U booking classes and you could be eligible for complimentary hotel nights at select cities in India. Eligible Guests may contact Jet Airways at +91 79275 42276 for availing the complimentary offer. This complimentary offer is valid only on return flight and shall not be transferrable or redeemable for cash or credit. This offer is applicable on return journey only. No travel restriction dates. Jet airways promocode is not required to avail the discount. Book Now! Special fares in economy class starting from INR 19,914 on our direct flight between Bengaluru and Singapore at Jet Airways twice a day and earn 3x JP Miles. Fares are applicable on return journeys in Economy for travel between Bengaluru and Singapore on direct flights operated by Jet Airways airlines. Bengaluru to Singapore - Applicable on flight 9W 26. Singapore to Bengaluru - Applicable on flight 9W 25. Tickets must be purchased on or before month-end. Select any window, aisle or center seat at a flat fee of just Rs 200. Offer expires soon! Available only on Jet Airways website, mobile app, contact center, Airport ticketing counter and city office ticketing counter. Special seat select fee at Rs 200 each introduced for travel within India on flights operated by Jet Airways. Seats must be pre-reserved during the sale. Offer is not applicable for Bulkhead and Exit row seats. Verified on 20 Apr 2019. Jet Airways just introduced new routes within India in support of the Government of India’s UDAN Regional Connectivity Scheme, you can enjoy seamless connectivity between the below mentioned destinations. Jet Airways guests travelling in Economy can avail of Priority Advantage per guest, per sector for a nominal fee. This service is complimentary for JetPrivilege Platinum and Gold members. JetPrivilege Silver members can enjoy complimentary priority check-in at six metro airports within India and at all international airports. To avail priority bag service, JetPrivilege Silver members will be required to purchase Priority Advantage. Bid for your upgrade and you could get a chance to fly in first class or premiere class tickets. If you are eligible for an upgrade, they will send you an email to bid for it 7 days prior to departure. Choose to bid for the upgrade and pay via credit card only. Modify your bid at any time to increase your chances of winning the upgrade. If your bid is successful, they will charge your card and confirm the upgrade via email within 24 hours of scheduled flight departure. A revised boarding pass including the upgrade details will be issued. If your bid is unsuccessful, your credit card will not be charged and the original booking will stand. Zero Penalty Fees for changes or cancellations within 24 hours of booking on jetairways.com. Verified on 20 Apr 2019. Special fares in Economy class starting from Rs 48,784 on their direct flight between Chennai and Paris at Jet Airways website or app. Guests who have booked ‘Saver’, ‘Classic’ or ‘Flex’ fare options which include a complimentary meal, will also have the option to buy an additional meal of their choice from JetBistro. Jet Airways will Introduce their first ever non-stop service between Mumbai and Manchester, 5 times per week. Special fares in Economy starting Rs 49,860 on this flight between Mumbai and Manchester. This new service, in addition to their existing 3 daily, non-stop flights from Mumbai to London Heathrow and 1 daily, non-stop flight from Delhi to London Heathrow, enhances our connectivity and makes them the largest carrier between India and the UK. Now conveniently purchase excess baggage allowance on Jet Airways website, mobile app or through our call center and save flat 20% compared to airport rates. Say goodbye to last minute hassles at the airport. Excess baggage cannot be purchased online within 6 hours of departure. Excess baggage is not applicable for Multi-city travel. Online Excess Baggage is available in slabs of 5kgs, 10 kgs, 15kgs, 20kgs & 25 kgs. This discount is not applicable on the first 5kgs of Excess Baggage in Economy cabin on Domestic India routes. Checkout the landing page for more information. Excess baggage is available online for flights within India and across their international network. Guests with bookings will be entitled to free baggage allowance of one piece, not exceeding 15kgs for travel in Economy and 2 pieces, a total of 30 kgs, for travel in Première. Book now! Verified on 20 Apr 2019. Jet Airways now offers you a choice of 64 non-stop weekly flights between India and Europe. With a first of its kind partnership by an Indian carrier, Jet Airways together with Air France-KLM has now enhanced connectivity to Europe with 64 destinations via Paris and 84 destinations via Amsterdam. Grab the best Jet Airways corporate/SME discounts here. Get a Jet Airways personalized corporate travel plan for your business trips according to your preference and budget. Simply fill in the details in the form on the landing page and avail special deals. Now travel from Mumbai to Dhaka through Jet Airways and grab instant 10% discount on both Premier and Economy class tickets. No limitations on the round-trip journey. Applicable on return fares only. This offer is valid only on tickets booked through jet airways website (jetairways.com) or mobile application. 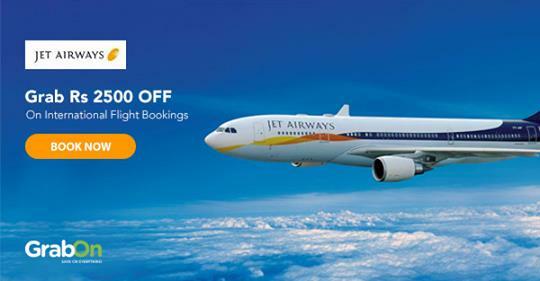 Additional Jet Airways coupon code is not required to avail the best flight discounts and deals. JetAdvance, a convenient new initiative that provides you the flexibility to take an earlier flight for a nominal fee of just Rs 1800 at Jet Airways. This facility is applicable for guests traveling on flights within India and wanting to advance their flights. To avail this deal, the time difference between the desired flight and the originally booked flight must not exceed 4 hours. A non-refundable fee of INR 1,800 is applicable per sector, per guest. Jetairways coupons are not required here. Book now! Jet Airways is offering cash on delivery and flight status features on ticket booking. You can now choose COD option as your mode of payment. Click here to view the list of cities where COD is available. On completion of the booking, an executive from Jetairways authorized agency 'Delhivery' will contact you to collect the payment at a convenient time. Jetairways promo code is not required to avail this special and unique limited period offer. Please follow the landing page for more details and instructions. Some guests want to travel light and on a budget, whilst others want to be able to make last minute travel decisions, carry extra baggage, earn more miles, enjoy benefits like lounge access, upgrade eligibility and priority check-in. Fare choices is a new initiative designed to provide you with tailor-made fare plans, giving you more choice, customization and transparency for your travel requirements. Special fares in Economy starting INR 26,806 on our non-stop between Goa and Abu Dhabi at Jet Airways. Looking for amazing discounts on your everyday flying? Have you tried Jet Airways yet? If not, then you should do it now. Because Jet Airways is not only the most renowned flight services but it also gives amazing discounts to all its customers. Be it business class or general class there is always some special offers for everyone. Jet Airways is one of the best flight service providing company in India. It is known for its exceptional service and performance. Avail the best price on flight tickets with jetairways coupon. Get the latest and best coupons and offers only on GrabOn. Jet Airways provides flight booking in almost all Indian cities and also flies abroad. It has partnered with Etihad Airways to give all its customers ease in international traveling. The smoothest way to travel in a flight is to fly with Jet Airways. Comfortable seats, cordial crew, expert pilots, delicious onboard food services and the best prices, what more could you want from your next travel? Apply the promo code for jet airways and enjoy traveling at amazing prices! Jet Airways is known for its services and pricing. It wants to cater to all classes of flyers hence it makes sure that the pricing is not too high. However, if you are looking for more savings on your flight booking then try Jet Airways coupons present on this site. All you need to do is come to GrabOn before you book the flight and look for the jet airways promocode to use while you’re on the checkout page of the ticket payment. Now, you don’t have to wait for last minute checking and get an aisle seat that you hate so much. You can do a web Check-in and avoid the queue at the boarding pass kiosk. You can get the boarding passes printed upon checking in. Jet Airways provides counters for bag drops where you can check your travel luggage. Now, you can travel hassle-free with Jet airways promo code. You can do a web Check-in 48 hours to 12 hours prior to your flight departure. Users with valid Jet Airways booking through an online portal or a travel agency. 9 travelers per PNR and a group PNRs with no more than 4 segments. Travelers departing from an airport which provides the online web Check-in services. For more terms and conditions related to web Check-in, please visit the Jet Airways website. Please note that you need to have a printed boarding pass from the Check-in kiosk. Always use jet airways discount code while you’re booking your flight tickets to enjoy the best tickets at the most affordable prices. Use the jetairways promo code and enjoy international travel at amazing prices. You can avail trips from Mumbai to Paris, Chennai to Paris and other jetairways offers like Best Fares Forever to trips across France and more. You can earn additional JetPrivilege miles as well the option to lock fares for a duration of 72 hours till you decide. You can also prepone your flight using the JetAdvance option which means you no longer have to get bored once you reach the airport earlier than your scheduled flight departure. Jet Airways isn’t limited to providing good services to their customer base, they ensure their customers get great offers and can fly often. With the jet airways coupon code, you don’t have to worry about shelling out too much money for a trip within the country. And, with the offer for the domestic flight, one can book a flight soon and save. Jet Airways provides Armed Forces Concession, Senior citizen concession and student concession for domestic flights. With the ongoing jet airways sale, booking flight tickets online has become easy. You can look out for the jet air offer and select the best code. Remember to use the offer code while your checkout. To know the current airfare charges or price for the day check out the jet airways offer today booking. Traveling abroad and worried about the flight charges? Use the international promo code 2019 to avail the best discounts for this year. HDFC, ICICI, Axis, SBI, and AMEX debit/ credit card users are in for a treat. Jet Airways provides bank offers to the (above mentioned) bank customers. The promo code for HDFC Bank can be used to avail discounts on economy or premiere flights, each with a different promo code. SBI being Jet Airways conversion partner, allows customers to convert their reward points into JPMiles. You can get an ICICI bank sapphiro credit card for Rs. 5000 and in return you get 10,000 JPMiles with complimentary Jet Airways ticket code. Like SBI, Axis bank also allows its customers to convert their reward points to JPMiles. So, don’t forget to save and redeem your points. Happy savings! Go to GrabOn.in type in Jet Airways in the search bar and press enter. Copy the Code and visit the Jet Airways website. Book your tickets, apply the discount code at the checkout page. The brand JetAirways does not require any introduction. With special schemes and plans like JetPrivilege Benefits, Best Price Promise, Signature Indian Hospitality, wide platter of food and beverages to choose from, JetAirways has come a long way in the hospitality arena, regardless of whether it is domestic or international. It has taken a step further to win hearts of its customers as it offers discounts and exciting deals on flight tickets, car rentals, and other allied travel services. You can now fly premier class even at affordable rates. Thanks to the coupon and promo codes that are made available to the customers online through the portal GrabOn. Here you can check out the deals that are regularly updated. For regular updates on the plans and deals, there is no better place to try out your luck than this portal. Notable are the cash back and early booking incentives that you get to enjoy when you fly JetAirways. Look out for Jet Airways coupons 2018, they are definitely worth purchasing. With incredible concessions on the flight tickets, you wouldn't want to delay the booking! Visit their website for latest offers 2018, you would be amazed by the kind of deals that are available. You can use the jet airways offer code to avail discounts on your airfare charges during checkout. Don't forget to use the promo code for jet airways when you book your flight. The code changes every now and then, so make sure you use the jet airways promo code 2018 for this year. Customers are happy with Jet Airways because they offer a ticket booking online service with attractive and irresistible deals one can’t resist. Go ahead and book your flight today.